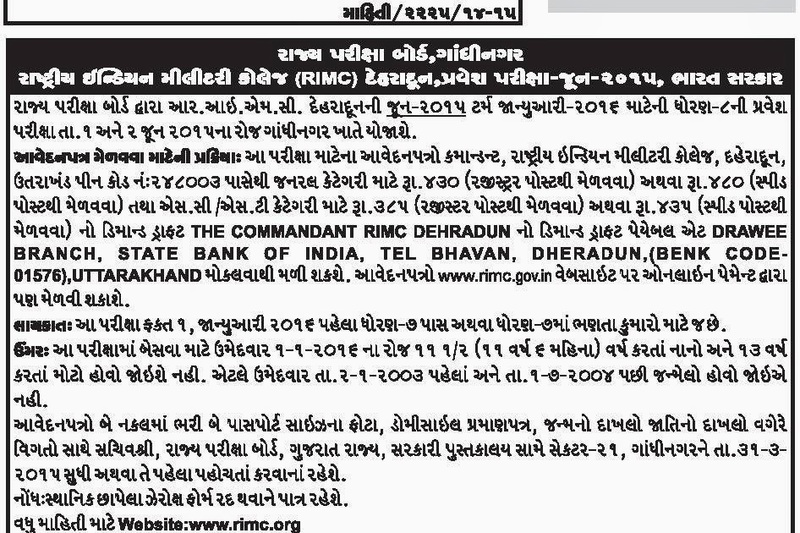 State Examination Board Dhwara RIMC Dheradun Ni June-2015 Tearm January-2016 Mateni Std-8 Ni Admission Exam Date 1 & 2 June 2015 Na Roj Gandhinagar Khate Yojashe. SEB RIMC Dheradun Admission Exam 2015 Application Form DD or Online Payment Thi Melvi Shakashe. Vadhu Mahiti Mate Official Website www.rimc.gov.in website Par Jovu. Qualification: 1 Jan 2016 Pahela Std-7 Pass or Std-7 Ma Abhyas Karta Students.